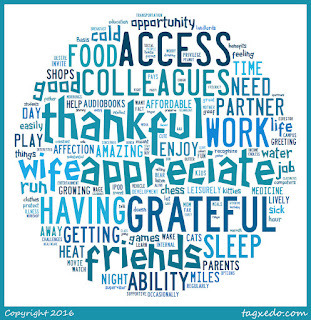 Word cloud of my gratitude reflections. I set out this year to be more grateful. So how's that going? Simply put, I feel I'm off to a good start. I begin my day with a gratitude acknowledgement. I usually do at least three; more if I so feel moved. I type out what I am grateful for using terms like, "I am grateful for..." "I am thankful for..." or "I appreciate that.."
I find this a wonderfully reflective and rewarding practice. My January was a bit rough--I had a cold that wouldn't go away and I couldn't run for several weeks. My running is my go-to for working out stuff, so having it inaccessible was a challenge during a month where lots is going on. Awaking every morning chockful of phlegm and coughing also proved challenging. Yet every morning, I was able to find many things to be thankful and grateful for. This helped me find a center and a place to sit with and acknowledge the many things that I don't always see or pay attention to in my life. 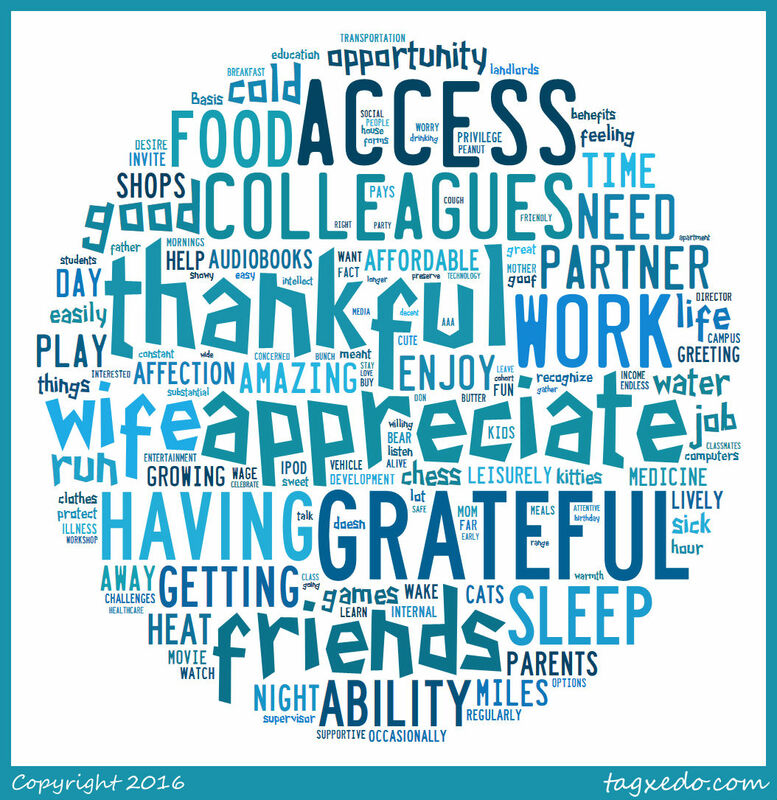 As I have moved into February, I am thinking about how I can up my game in terms of recognizing and reflecting on my gratitude. Obviously, one method is to do it more publicly and work to more openly thank people in a variety of methods: Shoutouts on social media, person to person acknowledgments, written notes or thank you cards, but I'd be curious to hear of other ways of illustrating, reflecting, and engaging in grateful practices. Please feel free to share your methods, practices and ideas!